New generation peptides which act in synergy with other advanced active ingredients, such as collagen, hyaluronic acid, vitamins etc., to achieve spectacular results for the skin and hair. 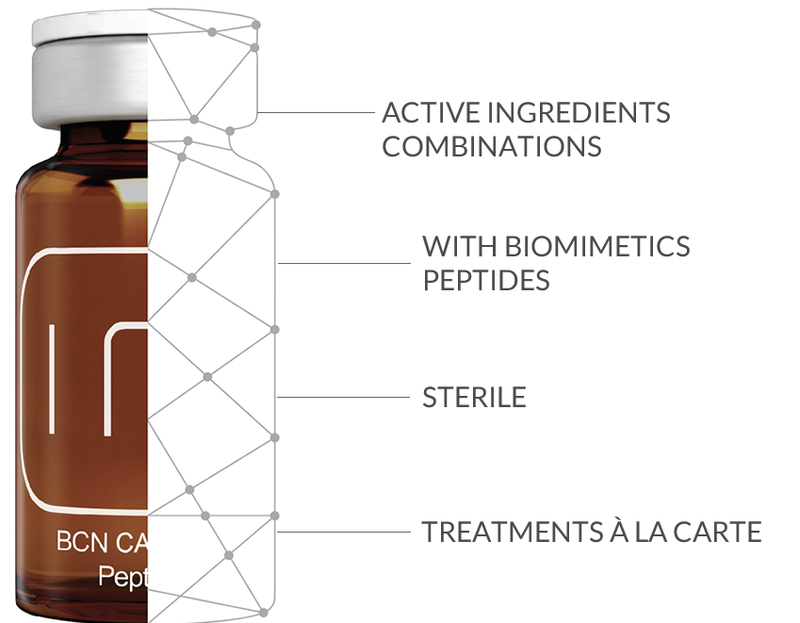 The BCN Advanced Cocktails-Peptides line is a range of products whose principal components are the so-called new generation peptides which act in synergy with other advanced active ingredients, such as collagen, hyaluronic acid, vitamins etc., to achieve spectacular results for the skin and hair. Peptides are molecules composed of a short chain of amino acids organized in a specific sequence which will determine their function inside the cell. Their principal function is intercellular communication, that is, acting as messengers in the different layers of the skin to transmit information between the cells, and so altering the way these cells function. With age, the signals communicating instructions to the cells to repair themselves and produce collagen and elastin, which is what keeps the skin smooth, firm and young, are switched off. The main task of the peptides is to communicate new instructions to the cells to restart these activities. To achieve this, the peptides act directly on the cell through specific receptors in the cell membrane, acting as antagonists or agonists of the cell mechanisms, modulating, controlling and regulating their biochemical functions.